The Taliban have vowed to intensify attacks on American targets, denouncing as “illogical” the U.S. decision to slow down troop withdrawal from Afghanistan. The Islamist insurgency was reacting Friday to U.S. President Barack Obama’s announcement that he will maintain the current number of American troops in Afghanistan at 9,800 through most of 2016, before trimming that number to 5,500 by the time he leaves office in January 2017. The administration had originally planned to keep only about 1,000 U.S. forces post-2016, with a focus on protecting the U.S. embassy in Kabul. Taliban spokesman Zabihullah Mujahid in a statement emailed to VOA said the insurgent group had repeatedly asserted that “the American troops would not end (the) invasion of Afghanistan” and their “fake promises” were meant only to mislead Afghans and the American people. Mujahid said Obama’s decision will not stop the Taliban from furthering its "fast-moving jihad (holy war)" against occupation forces in the country. 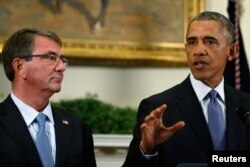 On Thursday at the White House, accompanied by Defense Secretary Ash Carter, Vice President Joe Biden and the Chairman of the Joint Chiefs of Staff Joseph Dunford, Obama said, “I do not support the idea of endless war. I repeatedly argued against marching into open-ended military conflicts that do not serve our core security interests." U.S. Defense Ash Carter, left, listens as President Barack Obama announces plans to slow the withdrawal of U.S. troops from Afghanistan in the Roosevelt Room at the White House, in Washington, Oct. 15, 2015. But, the president said, "The bottom line is, in key areas of the country, the security situation is still very fragile, and in some places there’s risk of deterioration. FILE - A U.S. soldier directs his colleagues at the site a bomb attack that targeted several armored vehicles belonging to forces attached to the NATO Resolute Support Mission, in downtown of Kabul. U.S. Secretary of Defense Carter said, “The mission now on a day-to-day basis is train, advise and assist and counter terrorism." Carter said the U.S. is intent on fostering stability in Afghanistan over the long term and will not give up gains that U.S. forces have fought so hard to achieve there. The U.S. troops in Afghanistan will be stationed at a small number of bases, including Bagram, Kandahar in the south, and Jalalabad in the east. "I think what happened in Kunduz is instructive. 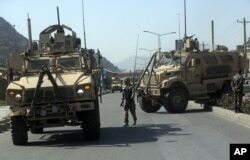 You had a situation where Afghan troops retook the city of Kunduz from the Taliban but only with the assistance of U.S. forces," analyst Michael Kugelman told VOA. "I don’t think there would have been a happy ending in this takeover or this retaking of Kunduz if it weren’t for U.S. support," said Kugelman, senior associate for South Asia at the Woodrow Wilson Center in Washington, D.C.
Officials said the U.S. slowdown in Afghanistan comes after months of deliberations between the White House, military leaders at the Defense Department and commanders in the field, plus Afghan officials, and after Afghan forces briefly lost control of Kunduz to Taliban militants. In his remarks, the president had a message for the Taliban and other extremist groups in announcing the delay in U.S. troop withdrawal. “By now, it should be clear to the Taliban and all who oppose Afghanistan’s progress – the only real way to achieve the full drawdown of U.S. and foreign troops from Afghanistan is through lasting a political settlement with the Afghan government,” Obama said. As he completed his statement, Obama told reporters the decision to keep more U.S. troops in Afghanistan than originally planned was “not disappointing” but necessary and consistent with his overall vision for a “dangerous area” of the world. “We have always known that we had to maintain a counterterrorism operation in that region in order to tamp down any reemergence of active al-Qaida networks or other networks that might do us harm," he said. Ayaz Gul contributed to this report from Islamabad, Mike Richman contributed from Washington.